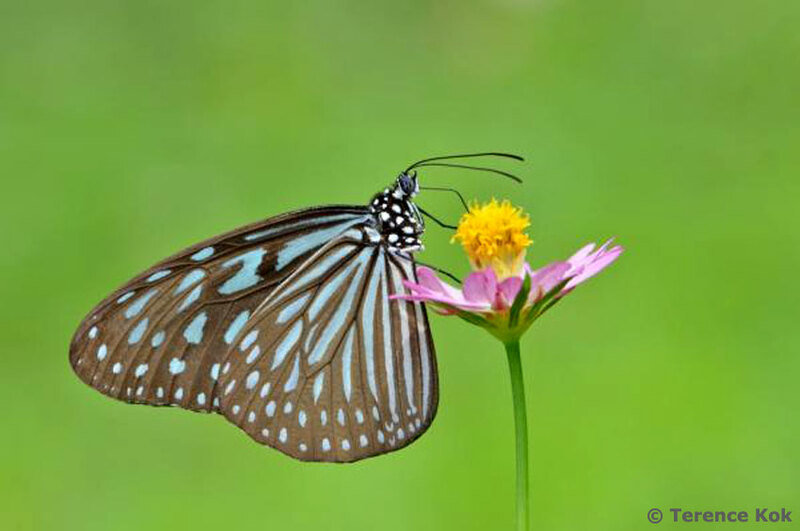 The Blue Glassy Tiger is a common butterfly in Singapore, and is quite widespread in distribution. It is found in parks, gardens, mangrove areas and even in the nature reserves. As its caterpillar feeds on lactiferous "milkweeds" the butterfly is distasteful to predators. It is a model for other species to mimic for protection from predators. 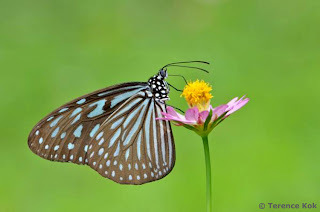 This shot, taken by ButterflyCircle member Terence Kok, was taken at Pasir Ris Park's butterfly garden. It is feeding on the flower of Cosmos caudatus or commonly called the Ulam Rajah. The plant is a member of the Asteraceae family. It is a popular herbal salad amongst the Malay community. The young leaves of the plant are eaten raw with sambal and the plant is believed to have medicinal properties.